Floor coverings of all kinds are often subject to harsh treatment. Because of the formidable skill involved in their creation, oriental carpets are designed to withstand most normal use and require surprisingly little care. Nonetheless, soil will eventually work its way to the base of the pile. Proper care and cleaning will ensure years of continued enjoyment of the rug's beauty and utility. In the Orient, it is customary to remove one's shoes and wear slippers when entering someone's home. Contrary to what you might think, the most destructive element to oriental rugs is not the rubbing action of smooth-soled shoes, but it is the grit — rough, hard particles of dirt — which is tracked indoors and sifts into the base of the wool pile. When you walk on a rug, this grit cuts against the strands of wool and severs small pieces of the pile. Removing your shoes and wearing slippers may seem impractical. Fortunately, there are other remedies available well worth considering described on the following page. Regular vacuuming will help prevent the destructive grit action discussed on the previous page. Find out from your oriental rug retailer the best type of vacuum cleaner for your particular rug and how often it requires vacuuming. Occasionally, you should also vacuum the back of the rug to draw out the very short, light-absorbing bits of yarn that can otherwise dull the luster of the carpet. This operation should be followed by a quick vacuuming of the face of the rug. Whenever possible, clean a spill immediately before it has a chance to set. First, scrape up any solid dirt or blot up excess liquid with a paper towel. Depending on the type of spill (e.g., oil, tea, and chocolate), a simple variety of household solutions may be used. Over time, grit and dirt become embedded so deeply that professional cleaning is required. Professional cleaning will remove this dirt as well as the surface soiling that gradually dulls the appearance of a carpet. Depending on the amount of traffic rugs experience, they should be cleaned every three to five years. 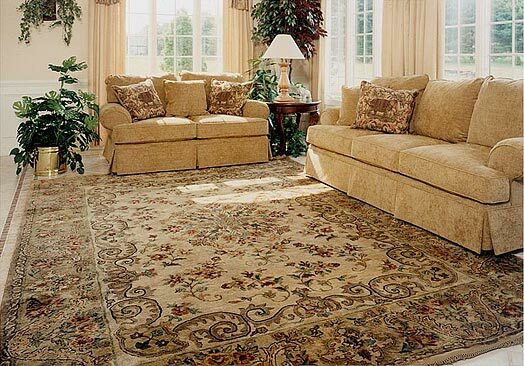 Cleaning should be done only by a professional cleaning service that specializes in oriental rugs, and not by a broadloom cleaner unfamiliar with the handwoven product. It is strongly recommended that cleaning not be attempted by a "wash-at-home" service. Contact the oriental rug retailer who sold you the rug or another reputable dealer in your area. If they do not offer a cleaning service, they should be able to refer you to a creditable firm equipped with the proper facilities. Padding should be placed under all oriental rugs, because it helps to protect them from wear, and prevents them from moving and wrinkling. Among the variety of padding types available are high-density foam padding, rubber padding, needle-punched poly-propylene padding with heavy rubber backing, heat-set poly-propylene underlay, and rubberized jute padding. Your oriental rug retailer should provide you with the type of padding that best suits your particular rug. To extend the life of your oriental carpet turn it 180° every year or two. This helps to even out your rug's exposure to traffic and sunlight. Seek professional assistance at once if you discover a small hole, tear, or worn spot. You should also get immediate advice if the fringe becomes ragged or the selvedge becomes loose. A reputable oriental rug retailer can usually attend to these repairs. If not, they can certainly refer you to a creditable repair facility. If possible, obtain at least two different estimates before having any repair work done. For day to day cleaning, your vacuum will do an excellent job of removing surface soil. It is advisable to use your vacuum attachments to reach under furniture for protection against moths, a potential threat to the lifespan of your Oriental carpet. If you should spill a liquid, use white paper towels to soak up excess moisture; then wet, rinse and blot again, raising the wet area until dry. For food spills, try to remove as carefully as possible with a dull knife, then follow the same steps as for liquids. If you should have to store your carpet for any length of time, take care to pack your Oriental with moth repellents, and wrap in strong paper. When arranging your furniture, it's wise to have some sort of protection under the legs to prevent the carpet fibers from being crushed. Lastly, most Orientals benefit from a professional washing every few years, but send them only to an expert who understands the care and extra attention they require. Your oriental rug is a work of art and deserves the same care and attention you would accord to a fine piece of furniture. Your efforts will be rewarded time and time again through years of lasting satisfaction with the unique beauty of your oriental carpet.